Rincon, Puerto Rico is known for its beautiful Caribbean sunsets, warm ocean breezes, golden sandy beaches, winter whale watching, fishing, world class surfing, snorkeling, scuba diving, and the famous Punta Higuera Lighthouse (El Faro de Punta Higuera). For those who just want to get away, Rincon (and nearby Añasco) offers miles of unspoiled scenic beaches. Come and experience beautiful Caribbean sunsets from the comfort of your own hillside vacation rental property! The following Hillside Vacation Rental Homes and Apartments are located in Rincon, click on each picture for a full page description. Click on picture Caribbean Surf Villas - Two 3 Bedroom and 2 bath Apartments and two 1 Bedroom Apartments, tastefully re-decorated with the following amenities: Fully equipped kitchens, Cable TV, ceiling fans, balcony with excellent ocean view and coastal views. Located near Sandy Beach. Click on picture Casa Ensenada - New Listing! This is a lovely private duplex home, located in Rincon Puerto Rico. It is surrounded by a lush tropical garden just steps from one of the most popular beaches in Rincon, Puerto Rico, Steps beach. Fully equipped apartments, 2 bedrooms 1 bath, with large covered and furnished balconies with hammocks, A/C in bedrooms, just a short walk to the beach and a short drive to Rincon's best surfing spots. Vista Tres Palmas - New Listing! 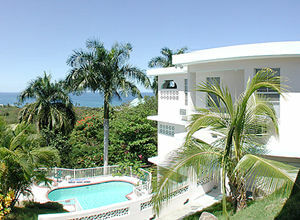 This is a lovely private duplex home, located in Rincon Puerto Rico. It is surrounded by a tropical garden, just steps from one of the most popular beaches in Rincon, Puerto Rico, Steps beach. Fully equipped apartments, 2 bedrooms 1 bath, with large covered and furnished balconies with hammocks, A/C in bedrooms, large back yard, BBQ Grill, roof top terrace with incredible view, just a short walk to the beach and a short drive to Rincon's best surfing spots. (max 4 people). 5 minutes away from Tres Palmas Beach. Just minutes away from Tres Palmas Beach. Click on picture Punta Beach Vacation Rentals- Four 2 Bedroom, 2 Bath apartments, nicely furnished with full kitchen, Air conditioning, ceiling fans, covered balconies, Cable TV, outdoor gril, washer/dryer access, telephone, private parking. Close to Sandy Beach, the view is spectacular! It now includes a Private Swimming Pool!! Click on picture Casa Vista del Mar- Two 1 Bedroom, 1 Bath apartments, elegant furnishings, full kitchen, Air Conditioning, ceiling fans, Cable TV, washer/dryer access, telephone, private parking, balcony with excellent ocean views & spectacular sunsets. Located just three minutes from Corcega Beach and downtown Rincon. Click on picture Tropical Tree House- A unique 3 Bedroom, 1 1/2 bath, bamboo house situated on 10 acres. This one of a kind house comes equipped with full kitchen, ceiling fans, patio, TV w/VCR, Audio, washer, and more. Find yourself amongst fruit trees, gardens, ponds, fountains, and other natural delights. Beach, shopping, city, just minutes away. A unique country living experience for those who want to get away from it all! ($10/day per additional person for up to 4 additional persons), Sorry No Pets. Click on picture Pipon's Resort- 1 & 2 Bed Bedroom, 1 Bath apartments, fully equipped kitchen, rattan furnishings, Cable or Satellite TV, ocean facing balcony, patio, picnic area, off street parking, located in a quiet hillside neighborhood. Close to Sandy Beach, the view is spectacular! 1 Bdm; 2 persons $125/night; 4 persons $135/night; $950/wk Daily Maid Service! Click on picture Pelican Estate- Guest House, 1 & 2 Bedroom Suites, equipped with kitchenette, Air conditioning, ocean facing porch, outdoor grill, Cable TV, swimming pool, telephone, large wooden deck. Just up the hill from Sandy Beach. Rates: 1 bedroom starting at $100 per night. 2 bedroom starting at $125 per night. Press here to view our Home Page and review other Properties.